Robusta or Arabica Coffee Beans, What’s the difference? You are here: Home / Just Coffee / Coffee Beans / Robusta or Arabica Coffee Beans, What’s the difference? 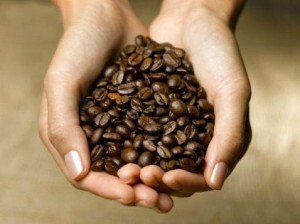 There are two basic types of coffee beans: robusta and arabica. Robusta coffee is the less expensive of the two. It is grown at lower elevations, is highly caffeinated and has an astringent flavor. Arabica coffee is a superior grade, and almost two-thirds of the coffee growers of the world cultivate this type of bean. Arabica beans contain about half the caffeine of robusta. Amongst arabica coffees, there are many subtle differences. However, the arabica beans can be broadly characterized by their growing regions. Beans from Latin America, for example, are typically a bit sweet and highly acidic and are often described as “subtle but crisp”. Beans from the Pacific, such as Kona beans are smooth, gentle, and mild, while Sumatran beans are distinguished by their full-bodied earthiness. Many canned coffees sold in supermarkets are a blend of both robusta and arabica beans. The same caffeinated coffee that you start your day with may interfere with a good night’s sleep, so a decaffeinated variety is a good alternative for later hours in the day. Coffee beans can be decaffeinated by two different processes. One is known as the Swiss water process, and the other as the direct contac method. The latter is usually considered to yield a more flavorful cup. As a general rule when brewing decaffeinated coffee, invest in the best decaffeinated beans you can find, and do not grind them until brewing time. So what’s your preference? Robusta or Arabica coffee beans? Join Bradford Coffee Club here and Save on Gourmet Coffee.